Sometimes referred to as "The Shropshire Carol"
Source: Cecil J. Sharp, English Folk-Carols (London: Novello & Co., Ltd., 1911), pp. 46-7. Sung by Mr. Seth Vandrell and Mr. Samuel Bradley of Donninglon Wood, Shropshire. This carol was sung to me by the two singers in unison, Mr. Vandrell refreshing his memory by referring to a small book of carols, printed locally, from which the words in the text have been transcribed. I have, however, omitted seven stanzas between the eighth and the last. "The Truth" is printed in A Good Christmas Box, and is included in Hone’s list [Christmas Carols now annually Printed, 1823]. A version of this carol to a different tune and with four stanzas only of the words, noted by Dr. Vaughan Williams at King’s Pyon, is printed in The Folk-Song Society’s Journal (IV, p. 17). For a variant of the tune see "There is a Fountain" in the same publication (IV, p. 21). Sixteen verses are found in the version printed in A Good Christmas Box (1847): The Truth Sent From Above, which also contains the complete notes for this carol. 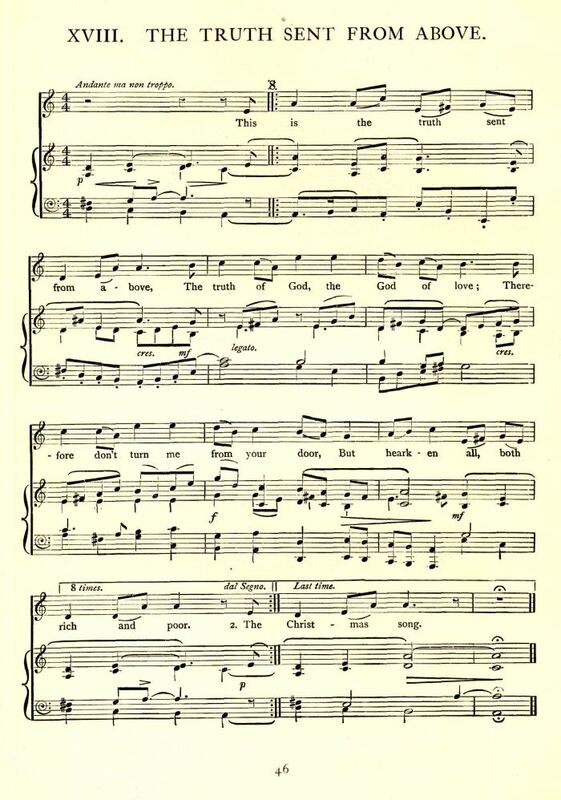 For the version from Herefordshire collected by Mrs. Emma Leather, and used by R. Vaughan Williams in Eight Traditional English Carols (1919), see: The Truth Sent From Above - R. Vaughan Williams. For the texts from two Broadsides that I've found, see: This Is The Truth - Broadside Comparisons.